University of Georgia Press, 9780820346878, 164pp. 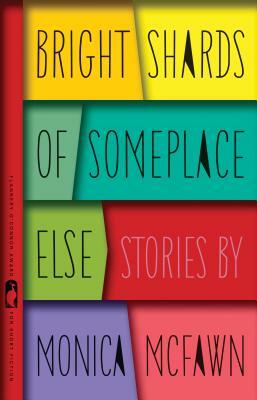 In the eleven kaleidoscopic stories that make up Bright Shards of Someplace Else, Monica McFawn traces the combustive, hilarious, and profound effects that occur when people misread the minds of others. The characters--an array of artists, scientists, songwriters, nannies, horse trainers, and poets--often try to pin down another's point of view, only to find that their own worldview is far from fixed. The characters in McFawn's stories long for and fear the encroachment of others. A young boy reduces his nanny's phone bill with a call, then convinces her he can solve her other problems. A man who works at a butterfly-release business becomes dangerously obsessed with solving a famous mathematical proof. A poetry professor finds himself entangled in the investigation of a murdered student. In the final story, an aging lyricist reconnects with a renowned singer to write an album in the Appalachian Mountains, only to be interrupted by the appearance of his drug-addicted son and a mythical story of recovery. By turns exuberant and philosophically adroit, Bright Shards of Someplace Else reminds us of both the limits of empathy and its absolute necessity. Our misreadings of others may be unavoidable, but they themselves can be things of beauty, charm, and connection. MONICA McFAWN lives in Michigan and teaches writing at Grand Valley State University. Her fiction has appeared in the Georgia Review, Gettysburg Review, Web Conjunctions, Missouri Review and others. She is also the author of a hybrid chapbook, "A Catalogue of Rare Movements" and her plays and screenplays have had readings in Chicago and New York.